There's a new wave in consumer plasma panels, and Sony's KZ-42TS1 is riding it. What makes this model different from all of the other plasma panels we've reviewed? The KZ-42TS1 is a self-contained unit with a built-in NTSC tuner and two stereo speakers incorporated into the bottom of the frame. This HD-ready WEGA model has a 1,024-by-1,024 resolution, is mounted in a panel measuring 30.125 inches high by 41.625 inches wide by 5 inches thick, and is framed by a 2-inch brushed-silver border. The menu covers almost every combination of picture setups you could want. In fact, the KZ-42TS1 has more software-setup functions than any large-screen display I've seen in a long while. Simply setting all of the adjustments in the normal setup menu would take a long time. After living with the unit for a while, though, I don't think I had to change 60 percent of the menu controls. This is the ultimate in custom TV alignment for the consumer. The owner's manual is a general guide to the adjustments, but it doesn't really tell you why you need to make each adjustment. This standalone TV has all of the necessary inputs to connect it to your home theater system. The unit will accept RF cable or antenna (off-air) signals via the single antenna input. Unfortunately, there isn't a loopthrough for your VCR or DVD recorder. The KZ-42TS1 has two composite and S-video inputs, with left and right audio inputs. The first component input is Y/Pb/Pr (with left and right audio on RCA jacks) for DVD players and high-def tuners. The second component input also accepts Y/Pb/Pr but adds an RGB input via RCA-style horizontal- and vertical-sync connectors. This connection also comes with left and right audio inputs. If desired, you can import an RGB game machine. To do this, you'll need to purchase a cable that converts HD-15 to five-wire RCA. The KZ-42TS1 has left and right audio outputs to connect the set to your audio system, as well as a full-range subwoofer output for those of you who don't have a separate audio processor. Make sure you have a subwoofer with its own crossover and level controls. The KZ-42TS1's TruSurroundSound mode produces virtual surround sound. The headphone jack is located front and center between the left and right speakers. I tried listening to the TV's internal stereo system, but speakers that are only 4 inches apart don't offer much stereo separation. There are five picture modes to choose from, each of which has several choices to set audio and video preferences. You can pick from different options for each signal format and store them in the TV's memory. The vivid mode's contrast and sharpness are set very high for viewing during broad daylight. The standard mode is an average setting that's adjustable. The living-room mode is toned down for moderate viewing. The movie mode's settings were the closest to what I like for watching DVDs, and the CineMotion function creates the smoothest image for 24-frame movies that have been converted to 60-field video using 3:2 pulldown. If you want to fully customize each control and audio setting, use the AV Pro mode. The TV offers three color-temperature settings. Adjusting the RGB white levels will create a warmer to cooler picture to match your tastes, and you can name your setting position. The Pixel Adjust feature allows you to adjust the pixels for sharper graphics. Aligning the graphics pixel with the display's pixel structure helps you avoid pixel artifacts on the TV's edges. Still, the picture from an otherwise-clean cable signal was unusually noisy with the KZ-42TS1's NTSC inputs, while the high-definition picture looked great. The KZ-42TS1's color-matrix mode gives you the ability to adjust the component levels for a DVD or other input. With the software's flexibility, it's easy to get lost. Thankfully, Sony has included a self-diagnosis function to help bail you out if you've programmed several of the functions incorrectly. Don't feel too bad about using this function. For me, the screen-size settings were confusing at first. The display has an automatic aspect-ratio-detection feature with two separate settings. The first setting is very aggressive. If you set the screen to wide, when the program goes to commercial, the screen size will change back to 4:3, so you have to select the wide mode to stretch the picture back out. The second setting only changes the screen when you change inputs—say, from TV to DVD. It won't remember the aspect ratio you used when you switch back to TV, though. The KZ-42TS1's white-field uniformity wasn't as uniform as I would've liked: There are a couple of red and blue spots throughout the display, but this may only be noticeable with images that have large areas of solid colors. The technology behind a gas plasma is similar to that of a CRT display in that the image consists of a lit-phosphor coating. A CRT uses an electron gun to ignite the phosphor, while a plasma uses gas. The phosphors are red, green, or blue pixel-sized spots. The downside is that the phosphor coating is much thinner on a plasma than it is on a direct-view CRT display, so phosphor wear occurs much faster. However, the KZ-42TS1 has both a picture inverter and an orbiter mode to protect it from uneven phosphor wear. The inverter mode imperceptibly reverses white to black and black to white, thus oppositely wearing the image to help reverse the effects of uneven panel wear. The orbiter mode also helps prevent noticeably uneven wear by moving the picture around in a circle. The picture only moves a few pixels, but it's enough to keep fixed horizontal and/or vertical images from burning into the phosphors in one spot. The orbiter's revolution time is adjustable from 10 seconds to five minutes. Even though only a few companies make the panels that are sold to display manufacturers, not all gas plasma panels are alike. You need to ask about life expectancy and burn factors when you shop for a plasma panel. 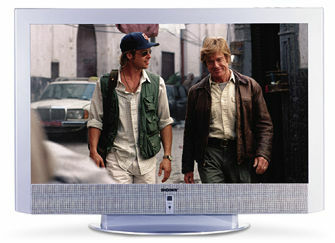 The KZ-42TS1 flat-panel TV is a good concept. It's made for someone who just wants to throw a TV in his or her bedroom without having to use a whole host of auxiliary equipment. In terms of image quality, though, the KZ-42TS1 faces some stiff competition in its price range. This model works better with widescreen and high-definition images than it does with NTSC sources like broadcast TV and cable. Ironically, the latter signals are the most likely viewing choices for someone in the market for an all-in-one display. © Copyright 2019 www.xtdump.net All rights reserved.